So if you followed my last post you have treated your lawn with an herbicide and now you have a lawn full of dead weeds with some grass underneath. Wait at least three days for the weeds to die and then it’s time to pull out your lawn mower. If it’s your first time mowing for the year it’s a good time to get your lawn mower blade sharpened. I just take mine off and use a file but there are people out there that will professionally sharpen it for a small fee. Do whichever works for you. Next adjust the height of your mower deck. The rule of thumb is to not mow more than 30% of your lawn at once. So if you haven’t mowed in a while you might take a few different mowings to get to your desired height. Right now my lawn is looking healthy at 2 inches and in the summer I let it grow a bit longer to 2.5 inches. I find that helps my lawn retain the moisture in the soil better in our hot summer months. 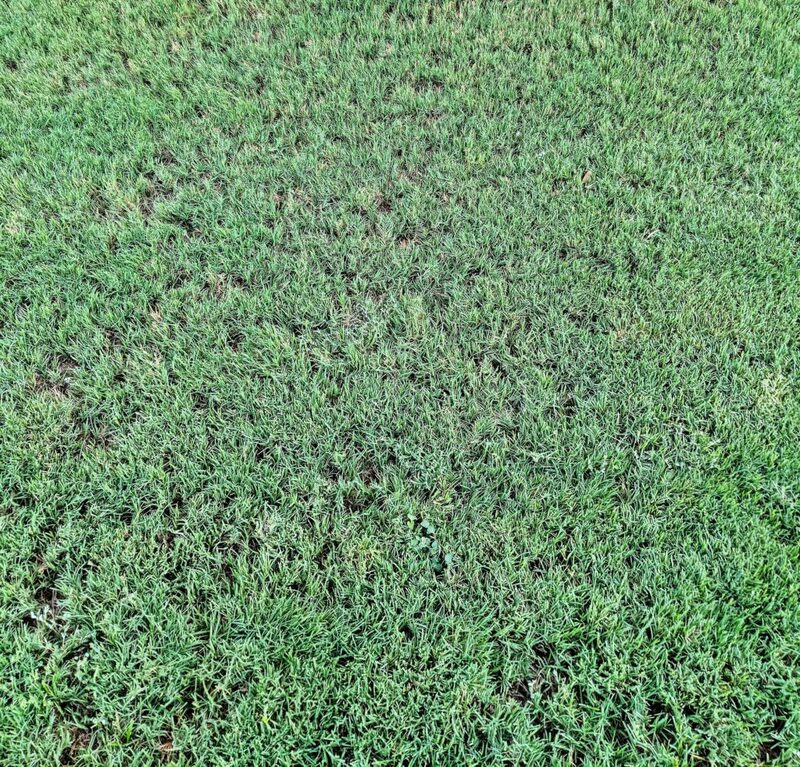 Experts in our area recommend as long as three inches for Bermuda. It will take you a little experimentation to see what works best for your lawn along those lengths. One small note: I don’t recommend 1.5 inches or shorter past spring. It’s very hard to keep that from burning up at that length. With this mowing I recommend bagging the clippings as it will have seeds from the weeds that you don’t want to put back in your lawn. On a regular basis I use the mulching function on my mower and I credit that as part of what helps keep my lawn and soil healthy. Another thing worth mentioning is how often to mow. In spring it starts growing pretty quick so you normally can’t go more than two weeks without needing to mow or else ending up mowing too much off at once. This is one of the more common mistakes I see in our area when someone mows every other month and their lawn struggles because every time it gets cut it loses more than half of the blade. Cutting on a more regular basis is much healthier for your lawn. If you can’t meet that schedule, get a lawn service or neighborhood kid to mow it for you. As another alternative SAWS offers coupons for removing parts of your lawn to replace with native plants, pavers, and other durable coverage. Check the SAWS website for details on that. As a note at the bottom here, you might have heard of somethings called scalping before. With Bermuda it goes dormant in the winter and becomes a nice gold/brown. In the spring that dead grass just gets in the way. I normally scalp my lawn at the end of February to the beginning of March. I normally do the mowing in two runs to get it all. I bring it down to 1.5 inches on the first run and then 1 inch on my follow up mowing as the shortest my mower can safely mow the lawn. I bag all the clippings from scalping as the clippings would be too thick and have little value back in my lawn as such dead grass. If you missed scalping earlier I would try mowing half an inch lower than normal this cutting which will get you some of the same benefits but won’t be as tough on your lawn as things seem to already be heating up quickly.